In Pictures: Showzam! 2015 – A five day celebration of the finest circus & street performances held in the UK’s favourite seaside town. 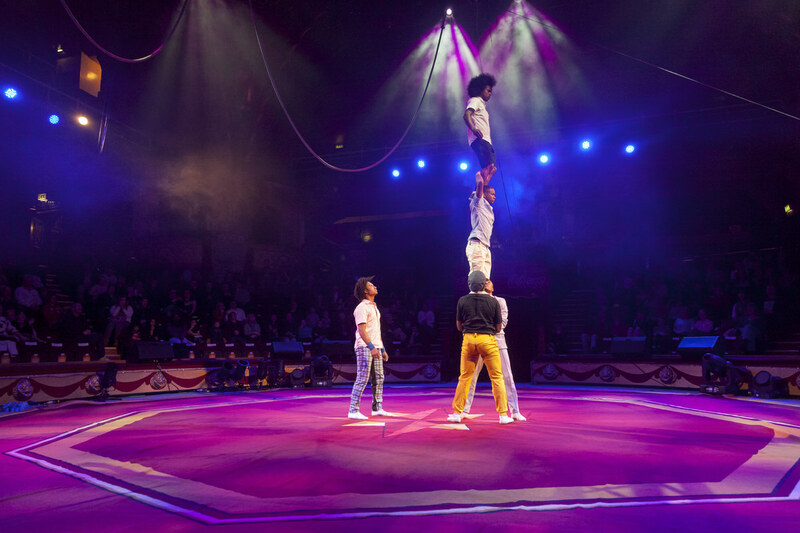 Do you remember the utter thrill and excitement of going to the circus? It truly is a wonderful feeling and, thanks to Showzam! 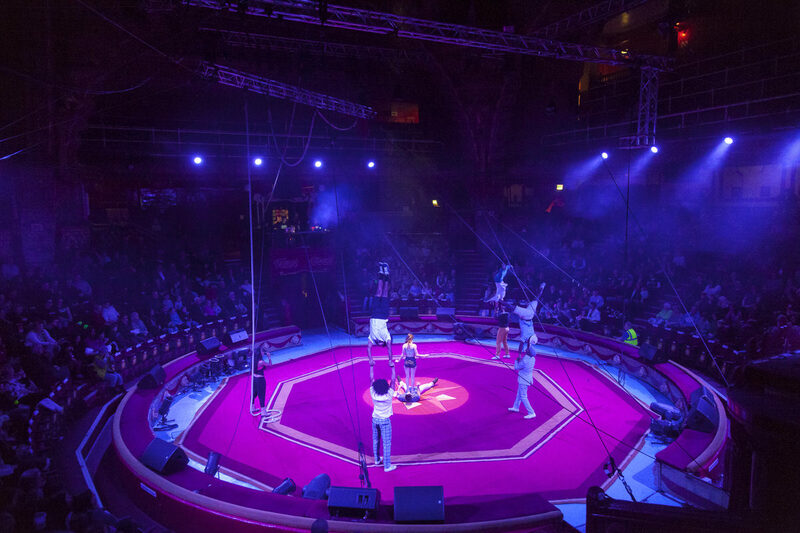 2015, we’ve just had five spectacular days of the finest international circus and street performances to relish and enjoy in Blackpool. Showzam! Presents Circus Town was a cultural and artistic programme held at several iconic venues in Blackpool (including Blackpool Winter Gardens, The Blackpool Tower Ballroom, Circus and the town centre) that was lovingly brought together by LeftCoast, VisitBlackpool and SeaChange Arts. Now in its 8th year, Showzam! attracts thousands of visitors to Blackpool and every year it just seems to get bigger and better. 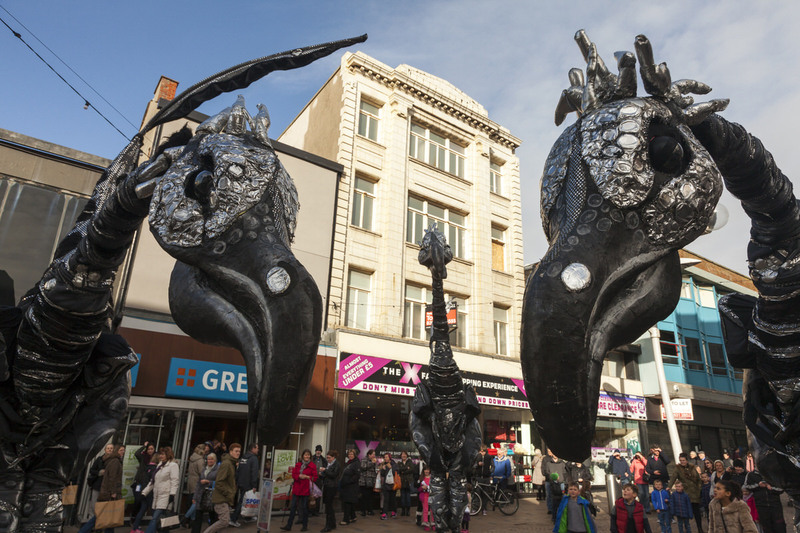 From the jaw-dropping acrobatics of South American circus sensation Circolombia at Blackpool Tower Circus to dinosaurs wandering the streets of the town centre, there was surprise and delight to be found around every corner. 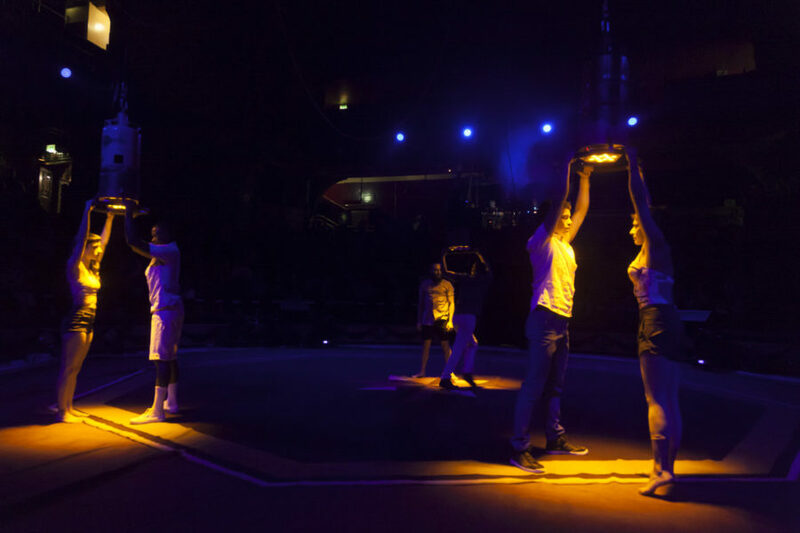 If triple somersaults, pirouettes and terrifying stunts (all choreographed to an original soundtrack) are your kind of thing then I think you’ll love Circolombia. 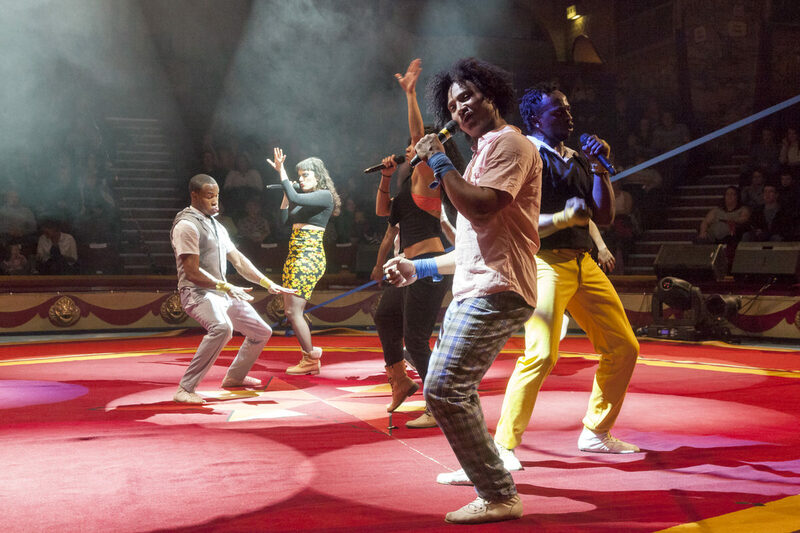 This high energy circus company has been described by The Guardian on Urban as “a show with real attitude” and, having seen it for myself, I’m inclined to agree. 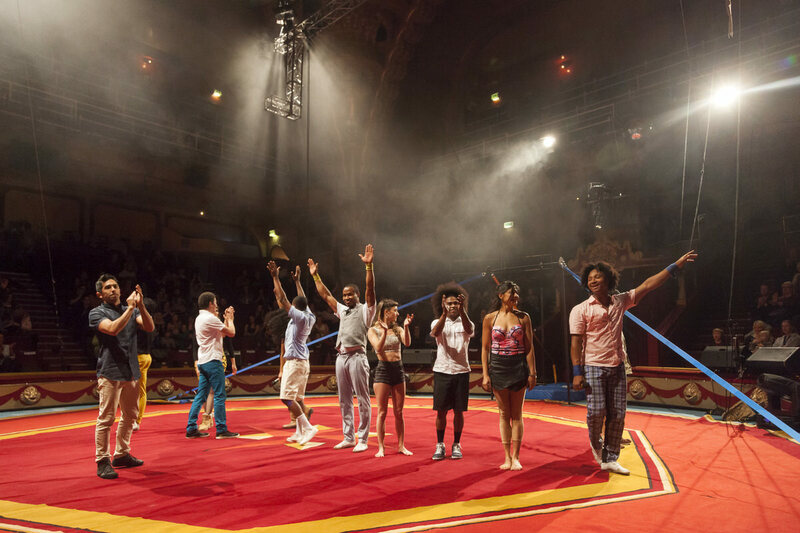 This is circus South American style – a show bringing together twelve of the most talented and highly skilled performers from across Colombia to entertain us with their fearless grit and impressive aerial techniques. These photographs of Circolombia were taken during the preview night on Friday 13th February 2015 where I was given the freedom to move around and photograph the event from all angles. 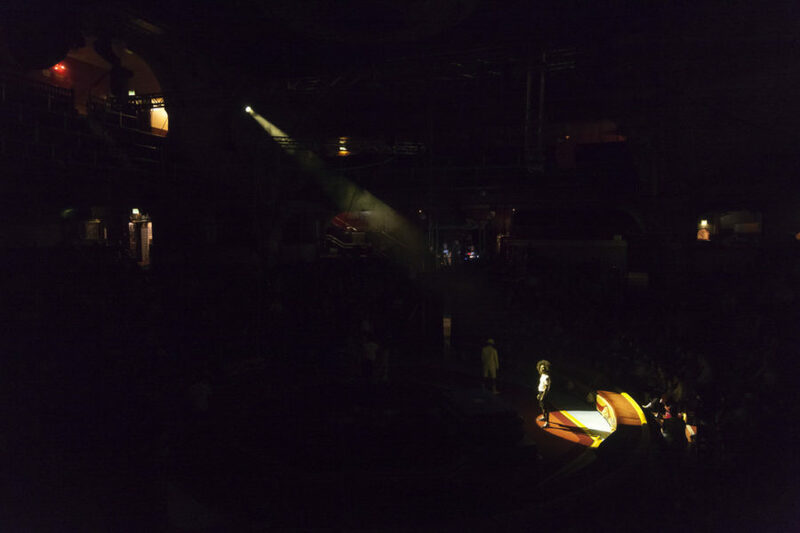 It was also the first performance of Showzam! Presents Circus Town and a great way to begin the five day celebration of circus and variety. Have you ever been swooped upon by three Sauruses?! I have and believe me, it’s quite terrifying! These beasts charge through the crowds with a deafening roar as they seek food to calm their hunger. Thankfully, Saurus are vegetarian and all the people screaming and jumping out of their way had nothing to worry about. The creation of three Dutch performers called Close Act, Saurus was a real favourite with the crowds at Showzam! If you’d like to hear the roar of Saurus play this sound recording above! Boucherie Bacul is an old fashioned Belgian butchery market booth where customers can purchase a range of delicacies. Run by twin sisters Simone and Chantal Bacul and assisted by their insane brother Marcel, they try to sell their morbid merchandise to the unsuspecting public. This delicious, twisted dark comedy sideshow is not for the feint-hearted but never to be taken seriously (despite the knives!). Taken out of context, this photograph of a semi-naked man in a green undies, may be somewhat difficult to explain! Thankfully I can explain all. The Magmanus Show was a Showzam! performance that was hugely popular and featured an angry, small acrobat and a gigantic yet loveable juggler. 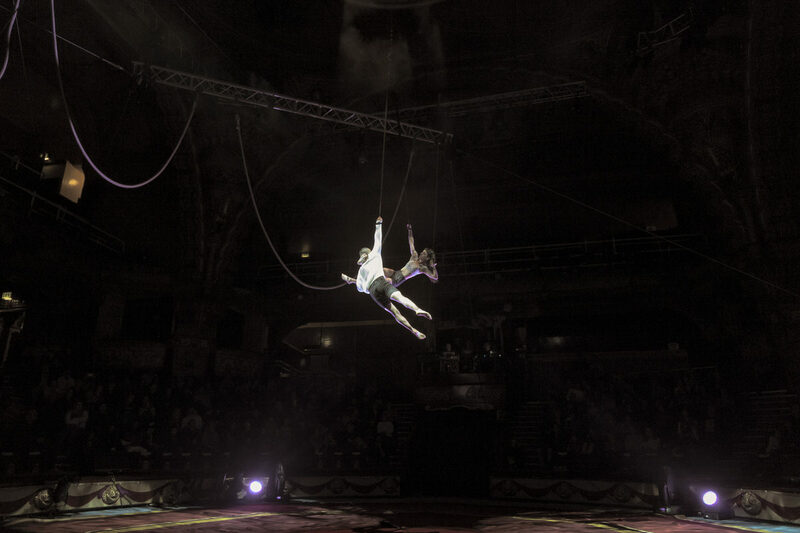 From Sweden, this duo entertained the crowds in The Grand Vestibule of the Winter Gardens with their warm circus show. Featuring mind-blogging skills and stomach churning comedy the Magmanus Show was one I will never forget. Did you enjoy Showzam! 2015 as much as I did? !What were your personal highlights? What were your personal highlights? I would love for you to share them with me by commenting below. Thank you for reading and, if you like what you’ve seen, please share this post with your friends and followers online. This entry was posted in Blackpool and tagged Blackpool Tower Circus, Circus, Family Events, LeftCoast, Showzam!, Winter Gardens.